For What It's Worth | Editor's Note | Kids VT - small people, big ideas! My family has a new after-dinner ritual: Monopoly. Not the junior version with the plastic game pieces and low-stakes investments. No, we've moved on to the real-deal, deluxe edition, with the hefty metal pieces, houses and hotels, and multitude of rules. 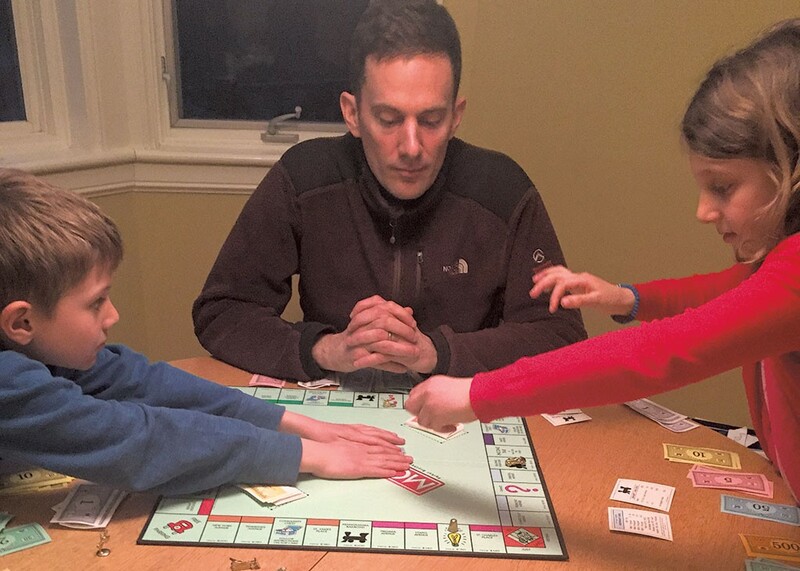 When we started, my first reaction was shock that both my kids are now old enough to play an involved board game without knocking things off the board or pouting when things don't go their way. But when that wore off, I realized that the game is actually a great teaching opportunity. While rolling dice and buying properties, we've had conversations about the meaning of words like mortgage, rent and insurance. And counting cash and calculating change make for great math practice. Monopoly has also helped me learn about the misconceptions my kids have about money. Six-year-old Theo, for example, feels like he's winning if he gives the bank one bill and gets two bills in return, regardless of the value of the currency. We've tried to explain that more bills doesn't always mean more money, but I'm not sure that's sunk in yet. He'll learn. Eight-year-old Mira is cautious about spending her dough, so we've tried explaining that investing in property isn't the same as giving money away. I think she's beginning to understand that concept. Navigating money matters doesn't get much easier as you get older. In "Tough Choice$," contributor Katie Titterton explores how Vermont families avoid falling over the "benefits cliff." That's the point at which parents make too much money to qualify for health care and childcare subsidies. It seems counterintuitive, but couples who do the math discover that sometimes it pays off when one partner declines a raise or leaves their job altogether. But does it really make sense for the state to incentivize workers to scale back or drop out of the workforce? This story anchors our annual Money Issue, timed to coincide with tax day on April 15. Our package of stories also includes a profile of a young entrepreneur ("One to Watch"), a recipe for making your own yogurt and granola ("Mealtime"), and an inspirational "Habitat," which explains how a Burlington mom turned her sons' bedroom into a batcave — on a budget. This month's "Bookworms" offers recommendations for resources that teach kids about personal finance. And finally, with summer vacation just around the corner, you'll want to peruse the camp guide. In "Time After Time," we surveyed local camps to find out about their quirky, fun traditions that keep kids coming back year after year. Perhaps reading it will be the jump-start you need to get your kids signed up for a session! Playing board games will only get you so far during that 10-week school break.